After much reading of bread books, and research on The Fresh Loaf forums, I have come up with a system for feeding my two pets sourdough starters living with me, so that they can feed me with bread! I have two sourdough starters right now, a whole wheat starter that I built up from scratch, named Fluffy. The recipe for Fluffy came from Peter Reinhart’s Whole Grain Breads , and started off as simply pineapple juice and flour. Pineapple juice? I hear you cry. Why yes, pineapple juice. Apparently, pineapple juice helps to inhibit the growth of Leuconostoc bacteria, and is a reliable method. I was sold after reading Debra Wink’s fantastic article about it. Make sure that I’m building up to the amount I need for the actual loaf of bread (most of Reinhart’s recipes call for around 14 oz or 396 g, so I use the formula below for Building Starter to Bread. Feed a little bit of the extra starter so that I still have some starter on hand, using the formula below for Feeding Starter. Discard the rest (either into Sourdough Starter Discard Pancakes, a jar in the fridge for pancakes later in the week, or into the garbage). For either formula above (a ratio of around 1:2:3 of starter:water:flour), I simply weigh out the ingredients, mix them together, and place them in a clean jar, and mark its current height with a piece of tape labeled with the time. Using a jar allows me to watch the rise of the starter so I can see how quickly it is doubling and therefore gauge how active it is, and when it is ready for bread. To make life easier, I usually keep my starter in the fridge so I only have to feed it once a week, or before I want bread. 2 hours before I want to feed Fluffy, I take him out of the fridge so he can come to room temperature. I then feed him, and place him back in the fridge only after he’s had a chance to really eat the new flour I’ve fed him (around 8 hours later). 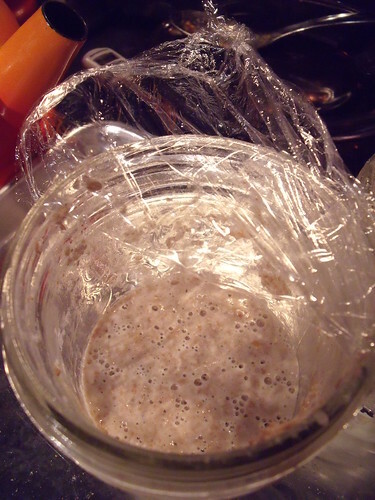 This comes to a ratio of around 1:3.5:3, making it a high-hydration (liquid levain) starter. Seeing as I’ve just fed both starters, there should be some lovely breads this week… stay tuned! I can always give you a new SOF in the new year 🙂 I’m always discarding bits of poor Fluffy!